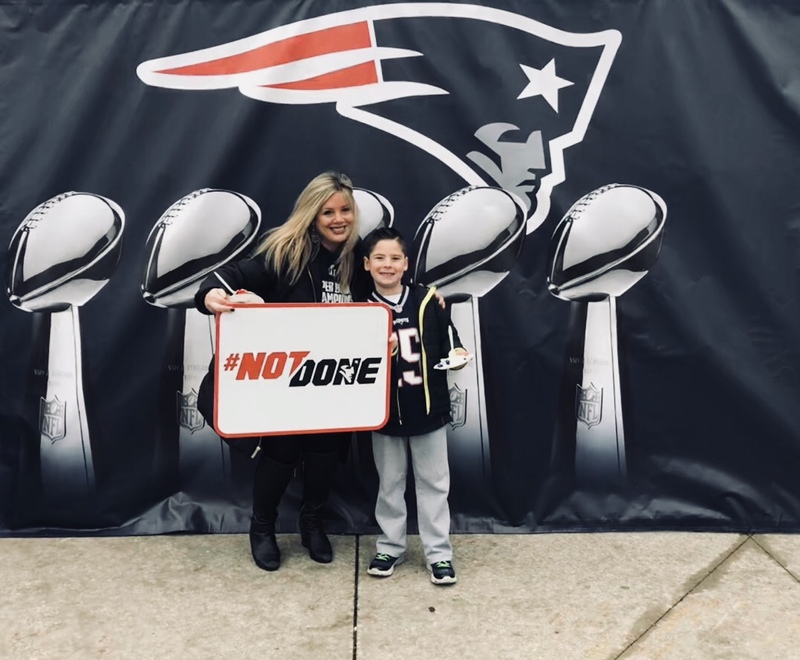 My son and I went to the Patriots Super Bowl rally at the crack of dawn this week. Incredible day with my beloved boy! Full disclaimer: I am an opinionated, loud mouthed, annoyingly irritating Patriots fan. Born and bred in Boston, living a scant 15 minutes from Gillette Stadium, it’s just in my genetic makeup. I love the Patriots. 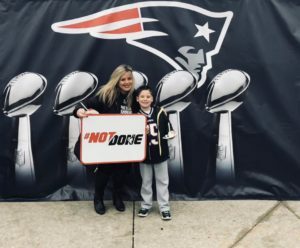 I got into some Facebook duels with delusional Eagles fans already this week, and threatened my husband (a die-hard Giants fan) with the couch if he talks smack against them on Super Bowl Sunday. 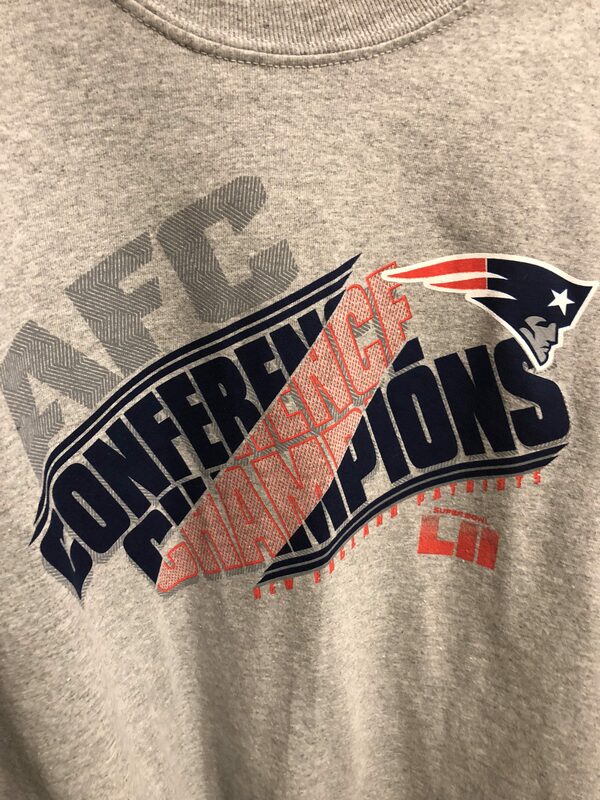 (My love came home with a brand new Patriots AFC Championship shirt for me to wear tomorrow; he knows where his bread is buttered). That said, I have some real compassion for everyone who isn’t cheering for the Patriots, the undeniably greatest football team (ahem, dynasty) of all time. It must be exceptionally difficult to gear up, season after season, hoping your boys will bring home a Vince Lombardi Trophy…and they wind up on the golf course instead. In my not-so-humble opinion, Tom Brady is the GOAT, but every other quarterback must have a better golf swing than him at this point. I will give them that. Anyway, like all good Patriots fans do, I have my own superstitions to care to before the big game. Since I don’t have a mustache or beard to grow until they win (another winning item in my genetic makeup that I am thankful for), I have food traditions. I must make stuffed mushrooms. And, most importantly, I must craft (whoops…Kraft) my Patriots Peanut Butter Cups. Clearly, if I drop that pass the Patriots are screwed, so I make them every year. Trust me, Tom, these are worth ditching your TB12 eating plan that fuels you to school quarterbacks half your age. When you deliver our sixth Super Bowl win tomorrow, it’s time to indulge. Combine peanut butter, butter, and powdered sugar. Cover and chill for about 15 minutes. Shape dough into footballs and dip in melting chocolate. 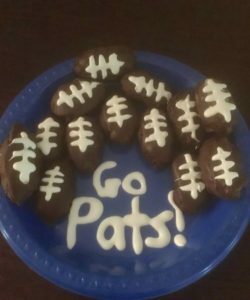 Pipe some white frosting on to create laces, write the necessary “Go Pats!” on the plate, and chill. Take them out of the fridge 20 minutes before serving. (Told you I am annoying). Thank you, Mike! I love you! This entry was posted in Superbowl, Thoughts, Uncategorized. Bookmark the permalink.